Posted on 2018-11-20 11:40:01 GMT+0000 by Neil Godfrey. 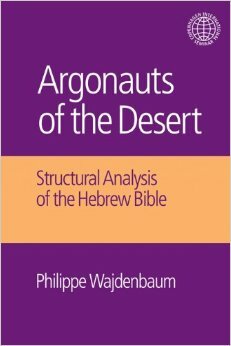 This entry was posted in OT Archaeology & Literature and tagged Gmirkin: Plato and Creation of Hebrew Bible, Wajdenbaum: Argonauts of the Desert. Bookmark the permalink. This is an honorable thing to do, to correct an error, in this case with the acknowledgement of Wajdenbaum’s work. In “Argonauts of the Desert”, as well as in several articles, I have proposed that Genesis-Kings (also called the Primary History) is the work of a single author, or at least the same team of scholars, who took inspiration from Greek classical texts such as Homer’s Iliad and Odyssey (see also Thomas L. Brodie, “Genesis as Dialogue”, 2001; Bruce Louden, “Homer’s Odyssey and the Near-East”, 2011), Herodotus’ Histories (as per Jan-Wim Wesselius, “The Origin of the History of Israel”, 2002), and Plato’s dialogues, most notably the Laws (on an idea by Yaakov Kupitz). In my article “From Plato to Moses: Genesis-Kings as a Platonic Epic” (in “Biblical Interpretation Beyond Historicity: Changing Perspectives 7”, edited by I. Hjelm and Thomas L. Thompson, 2016, also available on the Bible and Interpretation website), I have pointed out that the Pentateuch seems to borrow significantly from the Odyssey (the wanderings of the Patriarchs and Israel, Joseph’s story as a rewrite of Odysseus’ return to Ithaca), whereas Joshua, Judges, Samuel and Kings seem to borrow predominantly from the Iliad (the many battle scenes, especially in 1-2 Samuel). Yet, there are motifs from the Iliad in the Pentateuch and from the Odyssey in Joshua-Kings. This distribution of Homeric motifs interestingly corresponds to how Virgil modelled the first six books of the Aeneid on the Odyssey, and the six next books on the Iliad. In my opinion, this logic in the distribution of themes can be observed regarding most of the Greek sources used by the author of Genesis-Kings (such as the Greek mythical cycles of the Argonauts, Heracles, Thebes and the Trojan War), and tends to show its literary unity. Regarding the use of Plato, I have tried to show that a “Platonic framework” encompasses Genesis-Kings. Genesis uses several myths from Plato about the creation of the world (Timaeus / Gen. 1), the split of a primordial androgynous human (Symposium / Gen. 2) and the Golden Age (Statesman / Gen. 3; combined with Hesiod’s story of Prometheus and Pandora). The Exodus narrative, the liberation of slaves by a reluctant leader who had been freed beforehand, seems an adaptation of Plato’s famous Cave Allegory in Republic 7 (combined with the story of Battus, the founder of Cyrene). After receiving some of their divine laws, some of which are borrowed from Plato’s Laws, Moses and the Israelites perform a ritual for accepting these laws (Exod. 24) that seems borrowed from a similar ceremony in Plato’s Critias. The confection of the Tabernacle’s furniture by a craftsman based on a divine model echoes Plato’s theory of imitation of divine types in Republic 10. The book of Joshua narrates the foundation of the Ideal twelve-tribe state, with the division of the land by lot into twelve tribes and its subdivision into paternal plots of land, according to the model found in Numbers, which is itself based on Plato’s Laws. Judges, Samuel and Kings depict the gradual downfall of this state, due to the increasing faults of Israel and Judah’s kings. This demise of a state that should have been ideal and eternal seems borrowed from Plato’s tale of Atlantis in Critias. Solomon’s riches and grandiose temple in Kings resemble that of Atlantis, and God’s decision to destroy Israel and Judah at the hands of its enemies echoes the fate of Atlantis, punished by Zeus because its kings neglected the divine laws with the passing of generations. The final catastrophe of Jerusalem’s destruction by the Babylonians and the beginning of the Exile is reflected in Genesis’ narrative of the expulsion of Adam and Eve from Eden for disobeying the divine commandment, which seems the trace of a ring composition. I am entirely open to the idea of there being Greek influence upon the Bible and its being a 4th-3rd century BCE composition. As one who studies Buddhist texts (albeit as a mere amateur) I am aware that there is often a strong desire by people associated with a religious text to date it from the past and give it more authority. But my major problem with the idea that the Genesis-Kings narrative was the product of one author is the contradictions within it and the narrative doublets/paralleling. I mean, knowing when people knew YHVH’s name would seem like something very important for an author to keep track of, but this is not done. Likewise, two creation accounts, two accounts of the Flood mashed together, etc. Would your theory regard chapters 1-11 of Genesis, at least, as added by a later author or group of authors? I forget if it was Wajdebaum or Wesselius or another whose work I read addressing your point, but the explanation was that Herodotus likewise would place quite different stories about the same event beside each other, sometimes informing readers of his own preference between the two yet leaving it up to readers to decide which one they believed. The difference with Primary History, of course, is that the personal narrator’s voice has been removed from such intrusion into the narrative — except for bits noting that a certain story could be found in such and such a (probably fictitious) work. The removal of the narrator’s voice to the background, I think, more closely follows the style of ancient middle-eastern writing. Such then is the Persian story. In their view it was the capture of Troy that first made them enemies of the Greeks. As to Io, the Phoenicians do not accept the Persians’ account; they deny that they took her to Egypt by force. On the contrary, the girl while she was still in Argos went to bed with the ship’s captain, found herself pregnant, and, ashamed to face her parents, sailed away voluntarily to escape exposure. So much for what Persians and Phoenicians say; and I have no intention of passing judgement on its truth or falsity. Indeed, it was Wesselius who argued that the author of the Primary History imitated Herodotus’ technique of relating several versions of a story depending on his various sources. Wesselius argues that this was done by the biblical author in order to provide a sense of authenticity to their narrative. In other words, Wesselius shows that the impression that several accounts have been woven into the biblical text was deliberately intended. Wesselius therefore distinguishes between three possible levels of reading: the first one is the more traditional reading that takes the text literally and tries to harmonize the contradictions and redundancies. The second one sees the biblical text as made of a various strata, as does the documentary hypothesis. The third one is the reading that understands that the biblical text relies on Greek sources of inspiration. Likewise, Thomas L. Brodie in “Genesis as Dialogue” argues for the Primary History’s dependence upon Greek sources. For Brodie, the apparent doubled narratives in Genesis are so systematic that we should not read them as the mere traces of a clumsy editing, but rather as deliberate diptychs, created by one single author who used Homer’s Odyssey as a source of inspiration. I think the attempt to rationalize doublets (two different stories about the same thing) as a literary form used by historians assumes, without external evidence, that the Hebrew Bible was written as a history. The are other possible reasons for doublets that have nothing to do with history writing. Also, it is not as if the biblical text itself recognizes the differences between the doublets, unlike Herodotus remarked on the differences between the two narratives. Thank you, Philippe. I may copy and paste your comment as a post. I find it easier to accept a “committee” or “school” wrote the books of the Hebrew Bible than a single author. But we normally associate such groups or schools as sharing a common viewpoint. Can I ask your response to Russell Gmirkin’s point (one he made in PCHB) that the idea of unitary authorship would seem to flounder on the pro-Samaritan and then anti-Samaritan slants found in the earlier then later parts of the Primary History? The Pentateuch indeed appears as a more inclusive text that was adopted by both Judeans and Samaritans, whereas Kings provides the story of an exogenous origin for the Samaritans, which the latter would not accept. I understand that this can be an objection to Genesis-Kings being composed by the same scholar(s), but I don’t believe that I have a direct response to Russell’s relevant objection, that needs to be resolved. I can only provide more arguments for what I see as strong indicators of literary unity, which I perceive through a synchronic / diachronic reading. That is, we should not read these texts solely in their narrative order, but rather consider, as per Claude Lévi-Strauss, that everything happens simultaneously in a myth, and try to find what he would call “packs of relations”, both within the myth and within its variants, often found in another culture. For instance, I have tried to show how Jacob and David reflect each other, and were likely composed as a diptych (in my article Jacob and David, the Bible’s Literary Twins, in “Anthropology and the Bible”, edited by Emanuel Pfoh, Gorgias 2011; summarized in “Argonauts of the Desert”, 262-65). Jacob wanted to marry Rachel, and was given Leah instead by Laban, so that he had to work fourteen years instead of seven. David was promised Saul’s daughter Merab, but was given Michal, paying a doubled bride-price of two hundred foreskins of the Philistines instead of a hundred. Rachel was Benjamin’s mother, who was Saul’s ancestor. When Laban was pursuing Jacob, Rachel hid the teraphim (household gods) of Laban under her saddle and pretended that she was sick. When Saul was acclaimed king, he was found hiding in the luggage – as if Laban’s long-lost idol resurfaced years later. Both these stories took place in a place called Mitzpah. When Saul sent men to kill David, Michal hid her teraphim in her bed with goat-hair on top of it, pretending that David was ill – again echoing Rachel. David is described as red-haired and is said to have submitted Edom, that is, the descendants of Jacob’s red-haired twin brother Esau, thus fulfilling Isaac’s promise of Esau’s submission to Jacob. Jacob was limping after his fight with the angel, right before meeting his rival red-haired brother Esau. Conversely, red-haired David had a rival in Saul’s legitimate heir Mepphi-Boshet, who was limping from both legs. To help Jacob steal Isaac’s blessing, Rebecca had covered his arms with goat-hair (like in Michal’s pillow). Both Jacob and David had a daughter who was raped (Dinah, Tamar) and avenged by her brother(s) (Simeon and Levi, Absalom); and both had a son who slept with their concubine(s) (Reuben, Absalom). Whereas Jacob’s sons eventually reconciled after having sold Joseph, David’s sons killed each other (Absalom killed Amnon, Solomon executed Adonijah). On his deathbed, Jacob predicted that the tribe of Judah would provide the royal lineage. The way in which both stories mirror each other cannot be, in my opinion, the result of an ulterior author for Samuel echoing or paraphrasing a pre-existing Genesis. Rather, the stories appear to have been composed simultaneously in order to show how the kings of Israel failed to live up to the model of their ancestors, within an underlying anti-monarchic perspective derived from Plato’s political dialogues (I have compared David to Plato’s portrayal of the tyrant in the Republic). In order to create this diptych, the biblical author(s) seem(s) to have dismantled elements borrowed from the cycle of Heracles, starting from his ancestor Acrisius and his twin Proetus (some of these parallels were discussed by M. L. West in “The East Face of Helicon”, 1997). Like Jacob and Esau, they both fought in their mother’s womb, grew up as enemies and eventually reconciled and shared their father’s land. As seen in Iliad 6, Proetus once sent the hero Bellerophon carrying a sealed letter that contained orders to kill him, a motif also found in the story of David getting rid of Uriah. When Heracles was about to be born, Zeus promised that this son of his would rule over the other. Hera made him promise what he had said, and hasted the birth of another of his descendants, Eurystheus, so that he gained Zeus’ promise instead of Heracles (Iliad 19). This motif echoes how Rebecca helped Jacob trick Isaac in order to gain his blessing instead of Esau. Later, Heracles, Acrisius’ descendant, was offered to sleep with one of the daughters of king Thespius, who treacherously sent another of his fifty daughters each night to sleep with the hero, who did not realize it, like Jacob did not realize until morning that he had slept with Leah, sent instead of Rachel by Laban. Hence, we can see how motifs from the same Greek tale of Heracles (as one can read it conveniently summed up in Pseudo-Apollodorus’ second book of the Library) were distributed between Genesis and 1-2 Samuel. While some of the elements from Heracles’ ascendants and youth were attributed to Jacob (fighting twins, stealing the father’s blessing, sleeping with a sister instead of another), two motifs from Heracles’ cycle were given to Moses: the infant hero abandoned by his mother Alcmene / Jochebed, found and pitied by a woman who is supposed to hate him, Hera / the Egyptian princess, and sent back to his mother to nurse him thanks to his sister Athena / Myriam ; and the rescuing of the seven daughters of Atlas / Jethro). Finally, the rest of Heracles’ cycle has been attributed most obviously to Samson in Judges (fighting with a lion; the cutting of the hair as the source of strength by a woman during sleep, a motif related not to Heracles himself, but to Pteleraus, an enemy of Heracles’ stepfather Amphitryon; and so on). Hence, not only do intertextual links within Genesis-Kings provide clues of literary unity, but the examination of its potential Greek sources reinforces this assumption in that we can see how the Greeks myths were dismantled and rearranged between the biblical books. I have tried to gather several other examples of such literary diptychs, such as the Book of Kings bearing many echoes of Exodus, with Solomon almost enslaving the Israelites to build the Temple and his own palace, becoming like a new Pharaoh. Elijah appears as a new Moses. The story of the Levite in Gibeah (Judges 19) is a clear reflection of the angels visiting Sodom (Gen. 19); and so on. As argued previously by Wesselius, sometimes mirroring stories are found consecutively, as many of the doubled narratives in Genesis; but sometimes they are found separated by several volumes. In each case, these doubled narratives seem the trace of an elaborate composition. According to Thomas Römer there is a Qumran document of Exodus 1 where Joseph is listed as one of the sons of Jacob that came to Egypt with him (as opposed to the canonical version where Joseph had already been living in Egypt. This serves to support the view that either the Joseph cycle was a late addition to a pre-existing Genesis, or that Genesis was a late addition, a prequel to the exodus story. How does the claim to the unity of the Primary History deal with such a document? I don’t believe that this textual variant alone is evidence enough of the Joseph story or Genesis as a whole being late additions. Thomas Römer has expanded the ideas of R. Rendtorff regarding “fragments”, narratives that assumedly were originally independent of each other. According to this approach, the cycle of the Patriarchs in Genesis and that of Moses in Exodus were artificially joined together. In my opinion, once again, appeal to the underlying Greek sources of the Primary History rather shows the continuity between Genesis and Exodus, mostly through the use of the epic of the Argonauts. Cain, the first murderer, appears as inspired from first murderer Ixion, whose descendant was named Caineus (Wajdenbaum, Argonauts of the Desert, 2011, 101-3). Ixion was first united with Nephele, who was later given to Athamas. Nephele and Athamas gave birth to Phrixus and Helle. Athamas’ second wife Ino plotted to have Phrixus and Helle killed through a false oracle ordering Athamas to sacrifice them to Zeus. At the last moment, Zeus sent a winged golden ram that took Helle and Phrixus on its back. Whereas Helle fell in the sea named Hellespont after her, Phrixus reached Colchis (Georgia) and there sacrificed the ram and hanged its Golden Fleece on an oak-tree. Here we see the prototype for the story of the binding of Isaac, almost sacrificed by Abraham but eventually replaced by a providential ram, whose horns were stuck in bush (which reverses Phrixus hanging the ram in a tree after the sacrifice; Wajdenbaum, Argonauts of the Desert, 120-22). The biblical version appears as slightly demythologized compared to its Greek source: no flying golden ram. One generation later, the Argonauts brought back the Golden Fleece to Greece, and one of them, Euphemus, was promised by the god Trito that his descendants would inherit the land of Cyrene. Generations later, his descendant stuttering Battus was ordered by Apollo to lead the descendants of the Argonauts to the land promised to Euphemus. Battus protested that he did not feel up to the task, and that he stuttered, but eventually fulfilled his mission, ruling over the Cyreneans during forty years. Here, we recognize the prototype for Moses, who fulfilled the promise of the land made to the Patriarchs, reluctantly leading the Israelites during forty years, although he had at first protested that he stuttered and did not feel up to this burdening task. The epic of the Argonauts is the prologue of the story of the foundation of Cyrene, as seen in various Greek sources such as Herodotus, Pindar and Apollonius of Rhodes. It starts with a first murderer whose descendant was named Caineus, followed by a son almost sacrificed by his father, replaced by a providential ram; then the promise of a land for one of the protagonists’ offspring, and the fulfilling of this promise by a reluctant stuttering founder who ruled forty years. If we find such a continuous sequence in several Greek sources, I don’t believe that it is sound to assume that the same motifs found in the same order in biblical books were originally independent of each other in an unverifiable alleged tradition. Rather, the simplest solution is that the Greek epic was adapted into the biblical one. As I explained above how motifs from the cycle Heracles were spread into the various biblical books, here we see how motifs from the Argonauts were distributed. The apparent reason why the biblical authors chose to adapt the epic of the Argonauts and its epilogue was that they were giving life in a literary form to Plato’s ideal state from the Laws. So they fused this famous foundation story with Plato’s twelve-tribe utopia (Wajdenbaum, Argonauts of the Desert, 72, 150-52; see also several other examples of Greek foundation stories in Russell Gmirkin, Plato and the Creation of the Hebrew Bible, 2017, 225-31). Back to the story of Joseph, it appears as a clear rewrite of Odysseus’ return to Ithaca. Both Joseph and Odysseus are though long dead by their relatives, and face them in disguise, testing them and waiting the last moment to rival their identities in scenes of weeping and embrace. Both interpret dreams as foreshadowing future events, and both eventually meet with their aged fathers. The difference is that Joseph forgives his brothers, whereas Odysseus massacres Penelope’s suitors. In Odyssey 14, Odysseus invents a story in which he claims to have spent seven years in Egypt, becoming the friend of the king and gathering presents from the Egyptians; after which he was captured by slave merchants who tore off his tunic. Here we see the inverted sequence of Joseph first sold to slave merchants after his brothers tore off his tunic, reaching Egypt, eventually becoming Pharaoh’s friend and gathering the food of the Egyptians during the seven years of plenty (T. L. Brodie, Genesis as dialogue, 2001, 447-94; Wajdenbaum, Argonauts of the Desert, 136-42; Bruce Louden, Homer’s Odyssey and the Near East, 2011, 56-104). But how much of this apparently close parallel is contained within the text itself and how much is it the result of a subjective interpretation and subtle and inadvertent reshaping of the summarised versions? For example, you say that Rachel “pretended she was sick”, just as Michal pretended David was sick. But Rachel actually pretended she was having her period, which is somewhat different and minimises the parallel. The teraphim play different roles in the two stories; in the Rachel story they (plural) are central to the plot, being the objects that are stolen and hidden from Laban. As for the David story, you say that Michal also “hid her teraphim”, but that’s not really what happened; she made use of the teraphim to disguise David’s escape. The teraphim (here used in the singular) is really no more than a convenient prop, like the goat-skin that passes for David’s hair. Your rephrasing of the two passages makes the episodes appear far more closely related than the texts themselves suggest. And I was thinking that if the correction mentioned Wesselius exchanged between the authors proposed by the Documentary Theory ( I mean that if one correction is from P and another from J etc) then your theory is correct. In fact I first read your book and I found out about Wesselius from you and I tried to gather and read his articles that can be linked with this idea. “A New View on the Relation between Septuagint and Masoretic Text in the story of David and Goliath”, in: Craig E. Evans and H. Daniel Zacharias (eds. ), Early Christian Literature and Intertextuality, Volume 2: Exegetical Studies (Studies in Scripture in Early Judaism and Christianity, 15; London & New York: T & T Clark, 2009), 5-26.
he mentions a forthcoming book “God’s Election and Rejection” that it is going to be filled with those parallels. But sadly this book was mentioned as forthcoming in 2009 and still not published.